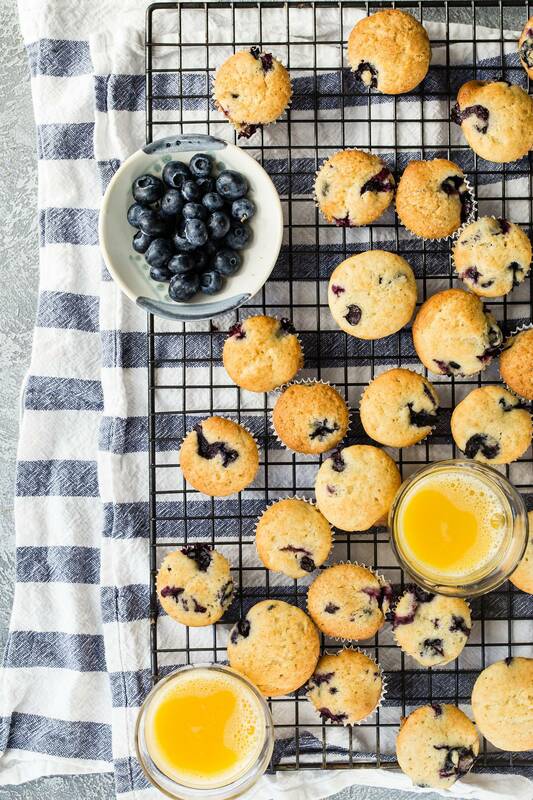 Keep school mornings simple with these light and tasty mini blueberry muffins. I make Quinn’s school lunch every morning, I used to make his sister’s too but I guess I’m not cool enough to do that anymore (eye roll). It can be hard to come up with healthy-ish items and still keep them exciting when he sits down at the lunch benches and opens up his lunchbox. luckily these mini blueberry muffins serve two purposes. They’re perfect as part of a regular breakfast when the sleepyheads eventually roll out of bed before school and they’re the perfect size for squeezing into a lunchbox! 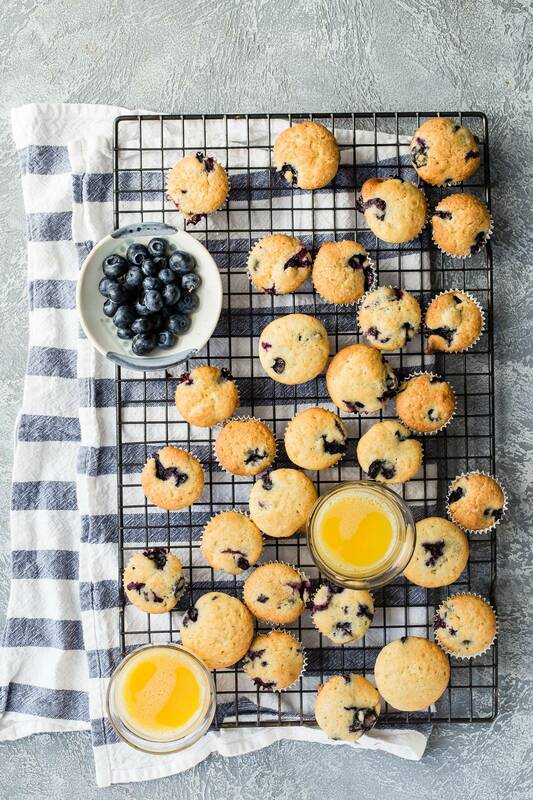 Who doesn’t love a blueberry muffin? And the fact that these are mini sized (and cute) just makes them all the more appealing to kids. Two bites and they’re gone! Or if you have an appetite like Quinn, one bite is all it’ll take to make them disappear. These mini blueberry muffins are really easy to make and are loaded with fresh blueberries. 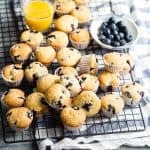 Make a batch on the weekend and you’ll be set for the whole week, this recipe makes four dozen mini blueberry muffins. If the kids are having them for breakfast, pop them in the microwave for 5-10 seconds and they’ll be stoked to be waking up to soft warm muffins. 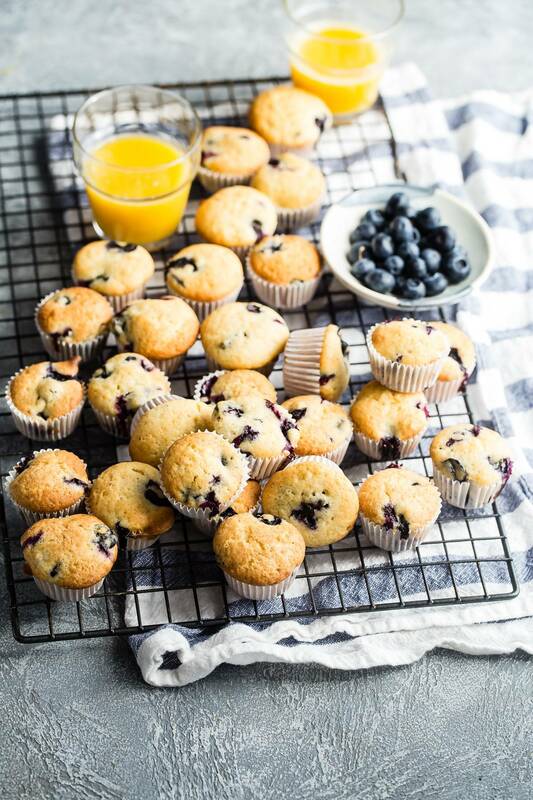 There’s no need to warm the muffins that you add to the lunchboxes, they’ll be perfectly thawed by lunchtime. These muffins are so good, do they have to be mini? No way, they can be regular size to for Mom and Dad! You’ll have to adjust the baking time as they’ll take a tiny bit longer to fully bake. I like to test my baked goods by gently pressing down on the surface. If it springs back, it’s ready. If it leaves a dent on the surface it still needs more time. Can I use another fruit instead of blueberries? Yes, you can, but remember these are mini muffins so adding big chunks of apple or cherries wouldn’t make sense. I’d recommend raspberries, chopped up strawberries or even diced peaches. Yes but I recommend using a cup and a half instead of two cups of fresh blueberries. When frozen fruit defrosts you’ll find yourself with more liquid and this can make the batter more runny than normal. The good thing about using frozen blueberries though is that your muffins will probably be bluer due to the blueberries being softer and more squishy than fresh. Happy back to school whenever it comes! 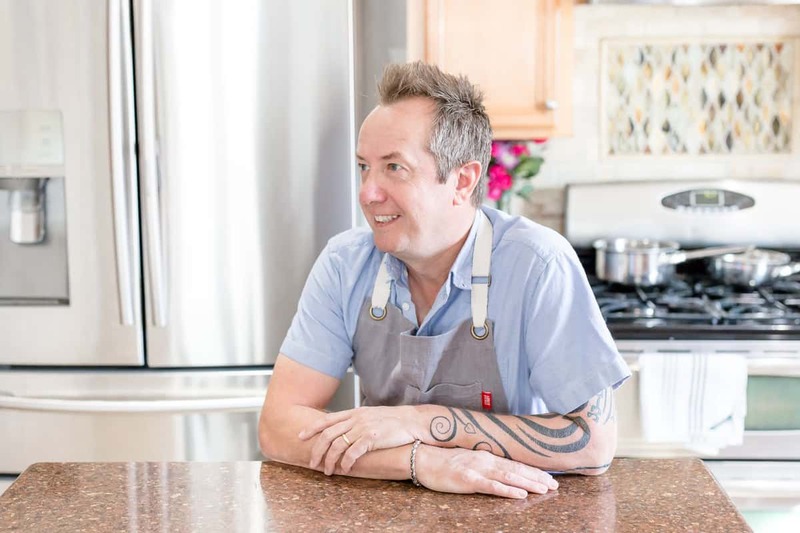 Don’t forget to follow along on Pinterest, Facebook, and Instagram for more recipes and awesome ideas! 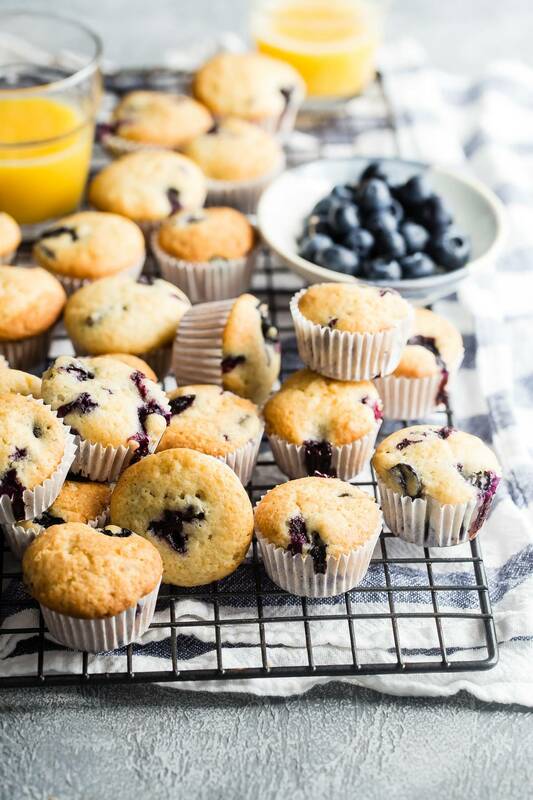 Easy mini blueberry muffins are perfect for back-to-school and busy school mornings! Preheat the oven to 375 degrees. Line a 24 count mini muffin pan with mini muffin papers. Using a stand mixer or hand mixer, beat the butter and sugar together until light and creamy. Add the eggs one at a time and mix well. Scrape down the sides of the bowl with a spatula. Add the vanilla and the flour, mix on low speed until combined and then add the milk. Add the blueberries and mix. Using a spoon scoop up some of the batter and drop it carefully into each muffin paper, enough to be level with the top. Place the pan into the oven and bake for about 17-20 minutes and the muffins are slightly golden brown on top. Keep stored in a ziplock bag or freeze and rewarm in the microwave for 5-8 seconds per muffin. I have 3 little Irish dancers about to go to an annual Irish Fair performance so these will be perfect fuel for the day, thank you, Gerry, for the great recipe. I have to ask: How did you not have half a bowl of batter left over after filling a 24-mini muffin tin?! I was left w enough to fill a regular sized 6-muffin tin after filling the mini muffins to the brim. Maybe that was your back-to-school surprise for us? :-) Anywho, thank you. Well, aren’t these the cutest muffins ever!! Do I need two mini muffin pans for these, or is the batter ok to hang out while the first 24 bake? Any chance, you can substitute the milk with sour cream? I have some left over and was trying to use it before it got bad. Hi Tara, i’m not totally sure it may make them more dense than usual but I think you’d still end up with a muffin!